Time to start believing those signs? You probably saw this on the Today show this morning, or will hear about it by a co-worker or friend by tonight. 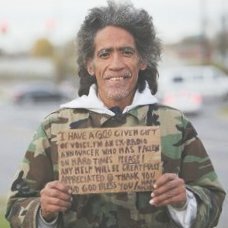 Here's the original video from the Columbus Dispatch reporter who found Ted Williams... the homeless man with the golden voice. Let's hope he can stay off the crack and booze and be a success once again.